For Spring 2014, Clé de Peau Beauté is going for a "La Bohème" theme with soft, romantic shades to evoke classic beauty. I was gifted their new Eye Color Quad in Peach Brown (211)* to test out and truth be told, I stared at the palette for a good three days before even allowing myself to touch the shadows. The beautiful gold overspray atop the shadows rubs away to reveal four complementary, easy to pair shadows. The packaging is black plastic which reflects navy blue when held to the light. 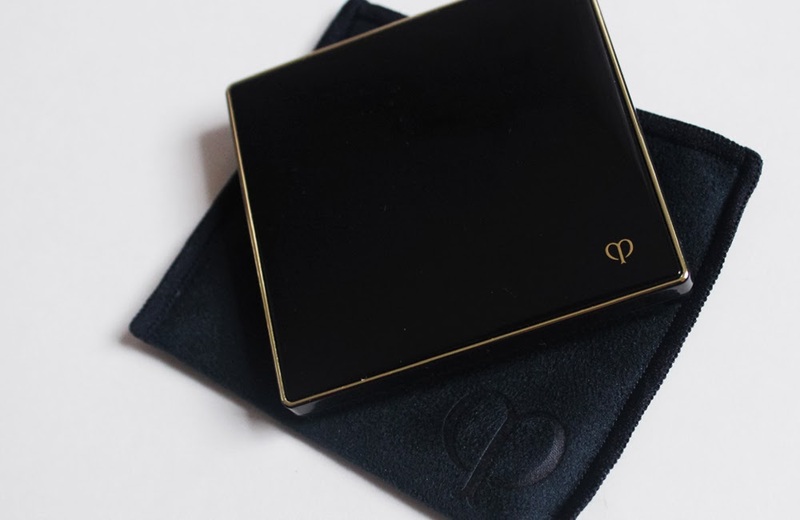 The edges of the palette has a touch of gold as well as the dainty Clé de Peau logo. The palette comes with a little cloth dust bag which is common with high end shadows such as Dior and Chanel. You also get two sponge tip applicators, one which has a brush end. Honestly, I do not use sponge tip applicators but if you don't mind them, these will do in a pinch. The top part of the compact has a generous sized mirror which is great for traveling or touch-ups throughout the day. 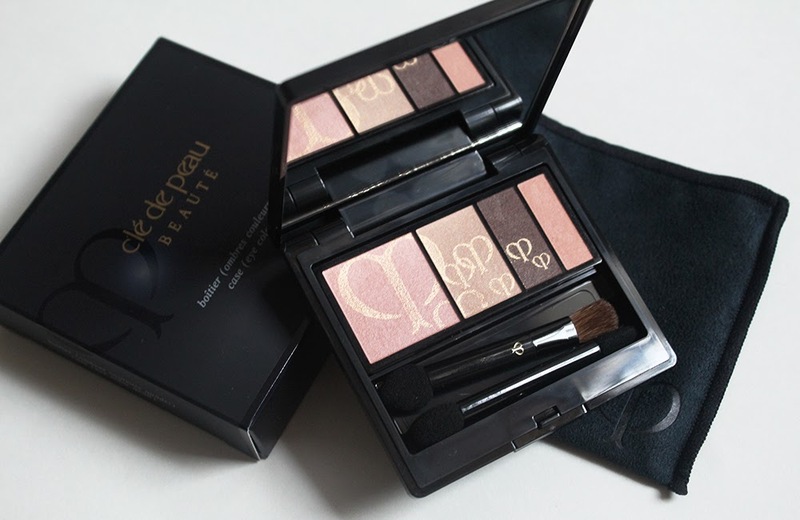 Clé de Peau eyeshadow palettes are sold with the refill and case separately. The refill snaps in and out of the case quite easily but always makes me a bit nervous that I might smush the shadows with my fingers or chip them with a nail. The refill costs $55 whereas the case is $25, making the total price of one palette $80. Yes, it is incredibly expensive for 5 grams (.17 oz) of eyeshadow. This is the most expensive palette that I own by far. Even Tom Ford eyeshadow palettes are only $78 and contain 10 grams, double the eyeshadow in the Clé de Peau quad. It looks appealing that the shadow pans decrease in size from left to right for some odd goemetric reason but in terms of practicality, I do not like being told which shades I should use more in a look. The last pan is pitifully small and I think it contains the most interesting and unique shade out of the palette. The shadows are buttery smooth and almost creamy to the touch. Unfortunately, they seriously lack in the pigmentation department. 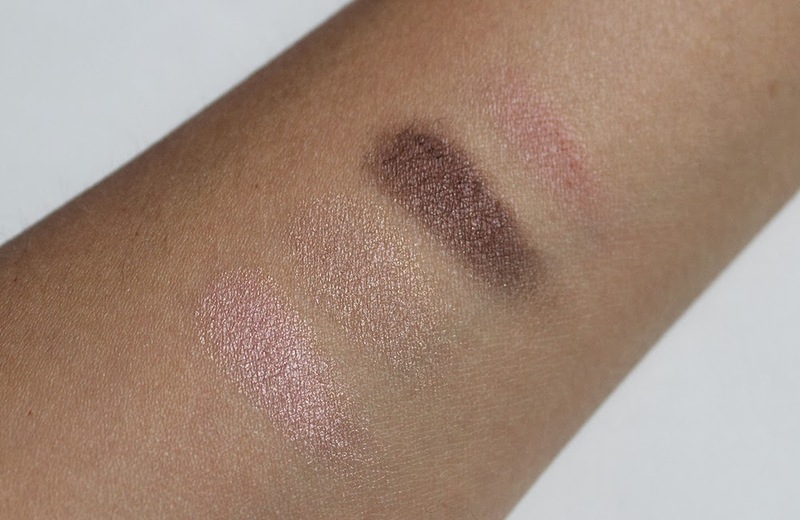 The shadows are very sheer and the three lighter shades pretty much look like nothing on my eyes once applied. Clé de Peau claims that the shadows are fomulated with argan tree oil for "fade resistant color" but the brown shade blends out into a muddy color and looks just plain meh. The first three shades have a very subtle shimmer in them and nothing remotely close to sparkle or glitter. If anything, they are satin finishes and not even shimmer. The last rose matte shade which I thought was very unique but it hardly translates at all when swatched. I was very disappointed in the Clé de Peau Peach Brown Eye Color Quad. The shadows were very smooth and the packaging is beautiful though the shadows are totally lackluster and a huge setback considering the price is so high. I can imagine a small minority of people who want the most smooth powder eyeshadows who want a barely there look to possibly enjoy this but even then, I can't recommend this product because it's just not worth the money. *This product was provided by PR for consideration. All opinions are my own.